It is with great excitement I share with you my second book, Submerged Into the Presence of God. It’s been a long four year journey. The path God led me down was thrilling, joyful, but also frustrating, and agonizing. I experienced a good many moments where the task God called me to felt like an impossibility. Time and time again God encouraged me and gave me the confidence to know that he can do anything, so I prayed for what only God could do. What I didn’t anticipate was that the woman who started this book isn’t the same one who finished it. I share God’s personal words to me as well as the unexpected and glorious encounters during my times in prayer, reading the Word, and through worship. God transformed me and continues to transform me into his likeness. It’s where I learned what it means to be submerged into the beautiful, supernatural presence of God. I am confident when you make the decision to embrace what it means to immerse yourself into God’s presence, he will transform you too. The more we strive to know him more, the more we will become like him, which is exactly what he wants us to be. I hope you will join me on this never-ending journey to know God more. To know that there are no substitutes to knowing him more than by devouring his Word, the Bread of Life. My time with God and experiences cannot be duplicated for they are my own personal moments with him. God drew me to himself in a different way during my personal times of prayer, and it is this that I believe he wants me to share with you. It is where we discover the more of God. 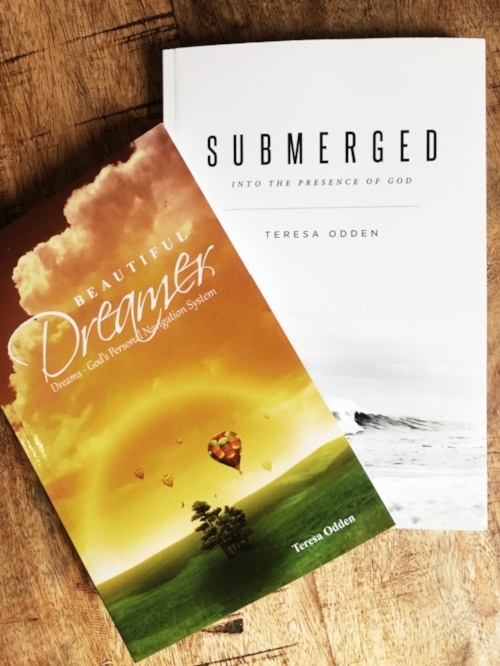 Submerged Into the Presence of God is now available in paperback on Amazon Prime, Barnes & Noble, and can also be ordered directly from your local bookstores. E-book will be available soon. I look forward to sharing more of the treasures God has brought from heaven to me personally. My first book, Beautiful Dreamer: Dreams - God's Personal Navigation System is available in paperback or e-book on Amazon. Discover the beauty of your God-dreams in the night.